The Cost Management Ecosystem is all about connections – connecting the right data, tools, and business logic to better understand and evaluate corporate performance. The framework defines the data, why it’s important, and how it touches different parts of the organization. And, enabling the framework requires a robust technology approach that provides global visibility to track performance and granular data to understand root causes. The Ecosystem diagram provides a one-page view of the critical data points that impact both costs and profits. Linking operations data like material and labor costs, to sales planning and general ledger spending data, the Ecosystem helps business leaders gain real, meaningful insights that drive informed decisions. 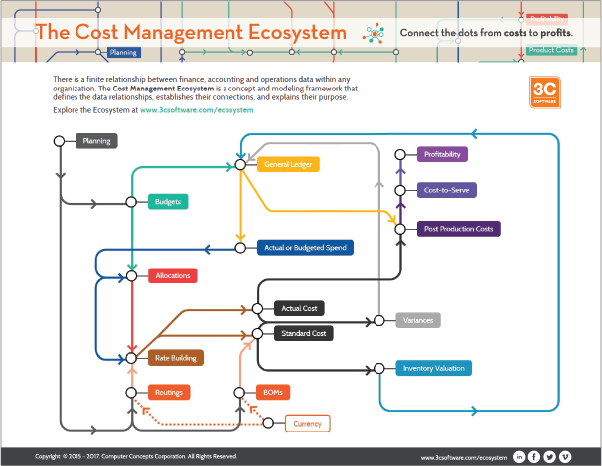 Download your copy of The Cost Management Ecosystem diagram or visit www.3csoftware.com/costecosystem for an interactive view of the Ecosystem. Leverage your existing IT architecture along with ImpactECS to enable The Ecosystem at your company. Learn more about the ImpactECS modeling platform and the companies we help, and the solutions we deliver.